Lua error in Module:Location_map at line 488: Unable to find the specified location map definition: "Module:Location map/data/Pacific Ocean" does not exist. 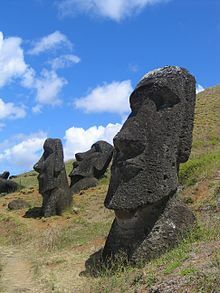 It is famous for its 887 huge statues called Moai, made by the early Rapa Nui people. 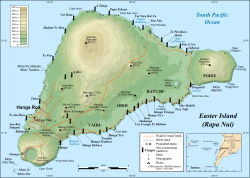 Easter Island also has a huge crater called Rano Kau at the edge of the island. In the crater there is a natural lake, one of only three bodies of fresh water on the island. ↑ 2.0 2.1 "Censo de Población y Vivienda 2002". National Statistics Institute. Archived from the original on 15 July 2010. Retrieved 1 May 2010. This page was last changed on 18 May 2018, at 12:03.